The Iceland National Football Team is managed by the Football Association of Iceland. Our Boys is the nickname of the team. The Iceland National Football Team played their first internationals in 17 July, 1930. Aron Gunnarsson is the team captain and Heimir Hallgrimsson is the head coach. In 2014, Iceland reached the qualifying rounds but failed to win against Croatia. In 2016, Iceland reached their major tounament of UEFO Euro and won against Netherlands. Iceland is the smallest nation to reach the World Cup. The team is in Group D in the FIFA World Cups. Iceland was qualified in 2015 for major tournament after finishing for the qualifications for EURO in 2016. Iceland reached the highest rankings twice in the FIFA World Cup. In 2018, Iceland is qualified for the FIFA World Cup with the first appearance in the championship all over the world securing qualification on October 9, 2017 after defeating Kosova by 2-0. 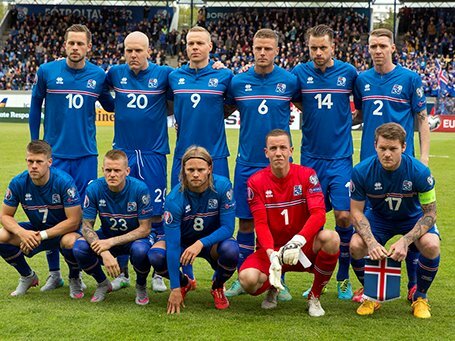 I hope you find the Iceland FIFA 2018 Team on our site. You can search other FIFA 2018 Teams squad on our site. If you like the post then don’t forget to share it with your family as well as friends. The squads of Iceland team for FIFA World Cup 2018 are announced. So, the squads are updated to this site. Stay connected with our website- www.fifahub.com for more updates.